I haven't mentioned this forthcoming edited collection here at ITM in a while, and want to do so while Amazon is offering the book at 20% off. 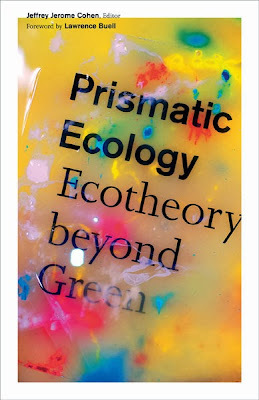 Prismatic Ecology: Ecotheory Beyond Green is out in early January. If you pre-order now via Amazon, the handsome and substantial volume costs only $20. Putting together this collection was quite a pleasure. The essays I was able to include (some of which I've already been able to teach) impress me with both their insight and creativity: I am honored to work with these contributors. The UMP website has a full description, but here's the table of contents. You might recognize a few names.